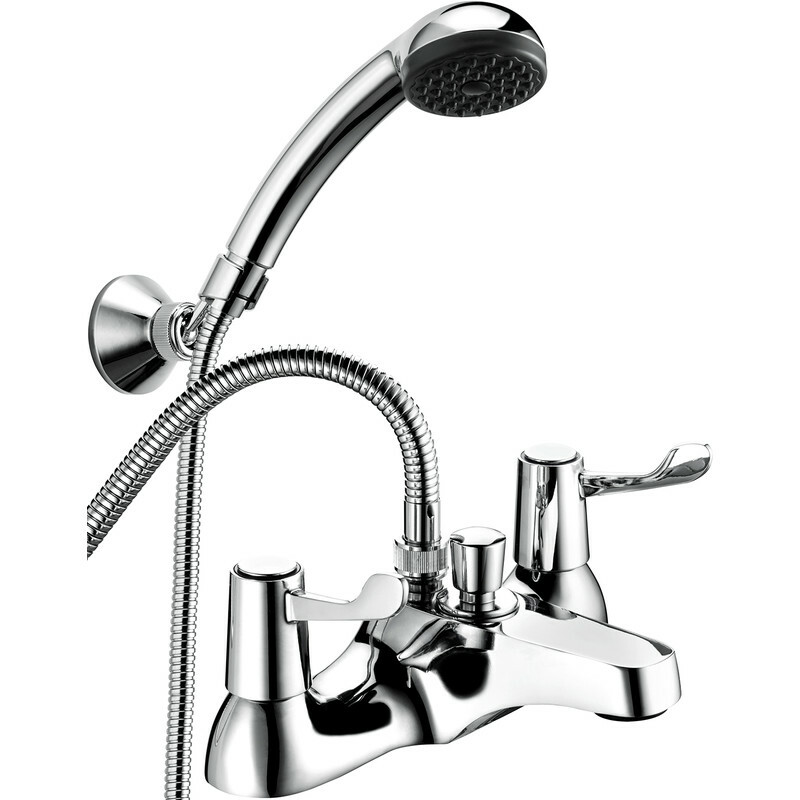 Contract Lever Bath Shower Mixer Tap is rated 3.7 out of 5 by 6. Rated 1 out of 5 by DML2 from Wall bracket not fit for purpose I bought this bath mixer tap as a replacement to match a Deva Contract Lever Mono Basin Mixer Tap that I had already fitted to the basin. The tap, hose and shower head look OK but I haven't fitted them yet because as another reviewer found, the wall bracket for the shower head is not fit for purpose. The photo that shows the shower head pointing upwards but this must be an "artist's impression" because the shower head won't stay in that position however much I tighten the ring on the wall bracket. The shower head flops down under its own weight and the weight of the hose and it can only spray water on the wall, not the person in the shower! The wall bracket is a useless flimsy piece of chrome plated plastic with a plastic ball and socket joint. The old shower head had a proper chrome plated metal wall bracket but I can't use the old wall bracket because the new shower head doesn't fit. The only solution is (a) put a hook in the ceiling and support the shower head with string or (b) fill the ball and socket joint with Araldite so that it doesn't move. This tap is going back unused for a refund but I am now lumbered with the basin tap that is already fitted but I can't get a matching bath tap that is fit for purpose. Rated 5 out of 5 by Simmo64 from Nice unit good value, This tap comes with a foam type gasket which is slightly smaller than the outline footprint of the unit. So if your tap holes are not a close fit for the threaded portion, as in my customers case on a 30 year old bath then you may find that it will be awkward to find a position whereby the gasket can seal both holes completely. There are recesses cast into the base which can take large rubber washer-gaskets but they’re not supplied.so I suggest you use plenty of sealer and plenty in the slack around the threaded portions in the bath. And a rubber washer under the backnuts. Of course if you’re drilling your own holes or the existing ones are a good fit then you won’t have this problem. Otherwise the tap looks good. Has a quality feel and a smooth precise shut off. The hose and head are good and it’s a good product. My issues are not with the tap but rather with the bath I was fitting it to. I’d recommend this product again. Rated 5 out of 5 by Kjs33 from Bath mixer tap I bought tap, it was delivered next day, installed it. It works as described, looks good for a cheap tap. Overall, very good service and a very good product. Rated 5 out of 5 by I can do that from Good looking as far as taps go This mixer tap appears to be of good quality quality. The shower head holder is a bit flimsy (plastic) compared to the rest of the kit so used the old one. Nice smooth action, no complaints so far!! Rated 5 out of 5 by iainn from Wet room Great bit of kit. Does exactly what its meant to.